Indian costumes have earned their global recognition, on the strength of their beauty and elegance. 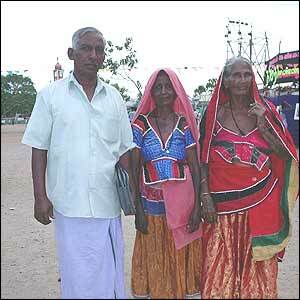 Many admire and love Indian costumes a lot, specially the costumes of Tamil Nadu. Sarees have a special place in the costumes of Tamil Nadu, and are an essential part of the state's heritage. The traditional costume for the Tamil Nadu women are saree and blouse, while for the men, the traditional costume comprises of lungi or dhoti as the lower garment, and angavasthram as the upper garment. Lungi is worn like a sarong. However, nowadays, angavasthram is frequently replaced by a shirt on the top. The western wear is gaining currency even in the traditional society of Tamil Nadu, specially among the men, who now prefer to wear shirts and trousers instead of lungi and angavasthram. In Tamil Nadu, sarees are available in various materials like cotton, chiffon, silk, georgette, crepe silk, organza, Pattola silk, micro silk, etc. Kanchipuram silk sarees of Tamil Nadu are very famous, and are worn by women on important formal occasions or occasions of celebrations, like wedding. Sarees in Tamil Nadu generally have lengths of five or six yards. There are also nine-yard sarees, which is used mostly by the Brahmin community of the state, after their marriage. However, salwar kameez has also become very popular among the ladies of Tamil Nadu. Salwar Kameez is like a loose trouser where the top end is wide and the bottom is narrow. Some salwars have shrink in the bottom which is called a 'churidhar'. And the tops of these dresses are called as 'kameez'. Women also wear embroidered saris, kurtis and salwars, etc. Kurtis is a top wear which is very short. Its ends at knees and is now used along with jeans by many women. And this is a very beautiful fusion. Many ladies from Tamil Nadu and elsewhere in India prefer to wear this instead of a t-shirt, with jeans. Pattu Pavadai or Langa davani is a traditional dress in south India and Rajasthan, usually worn by teenage and small girls. The pavada is a cone-shaped garment, usually of silk, that hangs down from the waist to the toes. It normally has a golden border at the bottom. Girls in south India often wear pattu pavadai or Langa davani during traditional functions. Mundum Neriyathum is the oldest remnant of the ancient form of the saree which covered only the lower part of the body, a traditional dress of women in Kerala, South India.The basic traditional piece is the mundu or lower garment which is the ancient form of the saree denoted in Malayalam as 'Thuni' (meaning cloth), while the neriyathu forms the upper garment the mundu. Mekhela Sador (Assamese: মেখেলা চাদৰ) is the traditional Assamese dress worn by women. It is worn by women of all ages. There are three main pieces of cloth that are draped around the body. The bottom portion, draped from the waist downwards is called the Mekhela (Assamese: মেখেলা). It is in the form of a sarong—very wide cylinder of cloth—that is folded into pleats to fit around the waist and tucked in. The folds are to the right, as opposed to the pleats in the Nivi style of the saree, which are folded to the left. Strings are never used to tie the mekhela around the waist, though an underskirt with a string is often used. The top portion of the three-piece dress, called the Sador (Assamese: চাদৰ), is a long length of cloth that has one end tucked into the upper portion of the Mekhela and the rest draped over and around the rest of the body. The Sador is tucked in triangular folds. A fitted blouse is worn to cover the breasts. The third piece is called a Riha, which is worn under the Sador. It is narrow in width. This traditional dress of the Assamese women are very famous for their exclusive patterns on the body and the border. Women wear them during important religious and ceremonious occasions of marriage. Riha is worn exactly like a Sador and is used as Orni. For men, traditional clothes are the Sherwani, Lungi, Kurta and Dhoti or Pajama. Also, most recently Pant and shirt have also been accepted as traditional Indian dress by the Government of India. A dhoti is from four to six feet long white or colour strip of cotton. 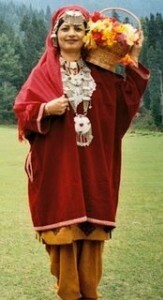 This traditional attire is mainly worn by men in villages. It is held in place with the help of a belt, ornamental and embroidered or a flat and simple one, around the waist. In south India men wear long, white sarong like sheets of cloth known as Mundu. In north and central Indian languages like Hindi, Marathi and Oriya, these are called dhothi, while in Telugu they are called Pancha, in Tamil they are called veshti and in Kannada it is called Panche/Lungi. Over the dhoti, men wear shirts. A Lungi, also known as sarong, is a traditional garment of India. A Mundu is a lungi except that, it is always white. It is either tucked in, over the waist, up to knee-length or is allowed to lay over and reach up to the ankle. It is usually tucked in when the person is working, in fields or workshops, and left open usually as a mark of respect, in worship places or when the person is around dignitaries. Lungis, generally, are of two types: the open lungi and the stitched lungi. The open lungi is a plain sheet of cotton or silk, whereas, the stitched one has both of its open ends stitched together to form a tube like structure.